I have always thought that an essential element of being a good clinician is the ability to be a good teacher. Educating patients and their families about their health and the steps they can take to improve it is not just a professional obligation. It is a foundation for trust, patient engagement and better outcomes. That’s why I am so excited about my new undertaking as the host of a radio show devoted to educating the public on matters of health and well-being. The show is called “Well Said” and is being produced by the Donald and Barbara Zucker School of Medicine at Hofstra/Northwell in collaboration with the award-winning Hofstra radio station, WRHU. If you are in the NY area, you can listen live every Monday at 4:00 PM on 88.7 FM. You can listen to a live stream from anywhere via WRHU live, available here or via the WRHU app, available here. You can learn more about the show, including access to prior segments on our website. A couple of recent articles got me thinking some more about the anticipated impact of “consumer health devices.” The first was in the Wall Street Journal and reported on the annual consumer electronic show (CES) in Las Vegas. The other was a review in Nature Medicine by Eric Topol on the current state of artificial intelligence in medicine. The Journal piece made the point that CES had more health-related offerings than ever before. Sure, the show still featured the latest home entertainment offerings (how about an 98” 8K OLED TV? 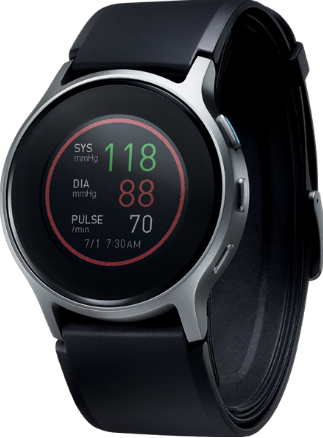 ), but now also showcased everything from a watch that can check your blood pressure (see below), to a sensor and associated app for assessing the quality of sperm in a specimen collected in the comfort of one’s own home (use your imagination). You can get a rundown on “all the new cool gadgets” here. Topol’s piece was a comprehensive (216 references!) look at the capabilities and applications of artificial intelligence in medicine. In particular, he assessed the impact of “deep neural networks” on clinicians, on health care delivery systems and on patients. These networks are a particular kind of machine learning that generate sophisticated pattern recognition algorithms based on an annotated set of images. The review is worth the read, but I would say the punch line is that there is incredible potential, but not (yet) much evidence, of the transformative power of artificial intelligence in medicine. That said, the inexorable growth and availability of large bodies of data in digital format (necessary to train algorithms), ever more rapid and less expensive computing power, and nearly unlimited data storage capacity in “the cloud” portend a much more extensive role for this technology. With the midterm elections in the rear view mirror, and a divided government coming, there has been a lot of speculation that the most likely outcome would be a grinding stalemate in Washington. So I was surprised when I saw a headline in the New York Times last week that speculated that progress in Congress was still likely on a number of important personal finance issues. When I read past the headline, however, what really struck me was that so many of the issues they reported on were really not about personal finance, so much as about how the crazy state of health care in America is a financial nightmare for so many. I had the opportunity last week to participate in a day-long meeting sponsored by the Heart Rhythm Society. The goal was to help HRS develop recommendations for physicians and industry on providing patients access to information generated by wearable and implantable cardiac electronic devices. The organizers invited me to provide the viewpoint of an educated patient. I can’t say how HRS will ultimately craft the guidance (and I am not involved in writing it), but the discussion was lively, and I came away with a number of impressions. First, device manufacturers understand that they must move to afford patient access to the data their products are generating, but they are limited in how quickly they can do so by a number of factors, including the slow pace of technical iteration created by close regulatory oversight, the uncertainty of what data patients want and how to present it, and concerns about getting out ahead of electrophysiologists (their traditional customers) on this issue. Nevertheless, I was impressed that there seemed to be unanimity of opinion among the manufacturers that patients should have access to the same data that doctors see. The program is developed, in part, through online voting for the presentations that people want to see and hear. Please consider supporting our proposal by going to the “SXSW PanelPicker” at: http://panelpicker.sxsw.com/vote/86636 and “vote up.” If you don’t have a SXSW account, it only takes a minute to create one and vote. Thanks, and see you in Austin! Since then, I have become more committed to the principle that patients should be the owners of their medical data and empowered to collect and manage it, and the technology to facilitate their ability to do so has improved remarkably. I recently purchased some of that new technology myself, and it goes well beyond what I was thinking was possible when I got excited 5 years ago at the prospect of self-monitoring heart rate. 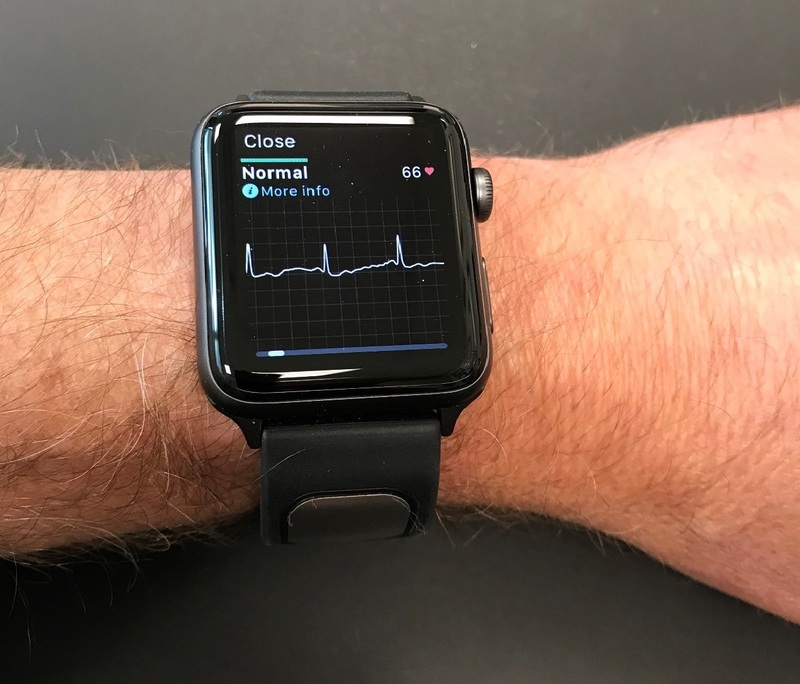 This is a picture of my wrist with my new Apple watch, equipped with the Kardia band and yes, that is my ECG. I am a terrible coder. I think I am a pretty good doctor, but when it comes to coding, the process of figuring out which billing code to pick to assign to a bill for an office visit, I am hopeless. No matter how many times I have had the rules explained to me, or how much feedback I have been given about specific visits, or which “pocket guide” to coding I have been handed over the years, I can’t seem to get it right. Even my errors are non-systematic. Sometimes I “over-code” (picking a visit level insufficiently supported by my note) and other times “under-code.” And the things I get wrong are all over the map – sometimes my history lacks some “elements,” sometimes my review of systems covers the wrong number of systems, sometimes my exam is shy an organ or two…you get the idea. It is very hard to get better if you keep doing different things wrong. Of course, this begs the question why doctors should be coding as well as doctoring, but that is an issue for another day. For now, my deficiency explains why I was intrigued to learn that CMS recently proposed changing the rules governing the coding and reimbursement for physician office visits. Currently, we are bound to rules for so called “evaluation and management” (E&M) visits that date back to the mid-1990s. The rules align the 5 levels of visit intensity (each coded with a different billing, or CPT code) with required documentation. There are parallel sets of codes (and documentation requirements) for new patient visits and established patient visits. Did I mention that this guidance is 90 pages long? Each code carries a different level of reimbursement, and commercial insurers use the same codes (at different price points) to pay for care of their subscribers. The new proposal pretty much scraps all of that. CMS is floating the idea of “collapsing” levels 2 through 5, and creating a single payment level for established patients and a single payment level for new patients, each of which is somewhere in-between what is currently paid for a simple (level 2) or complex (level 5) visit. The stated rationale is that physicians would be able to spend more time with patients and less time stressing over what to code (or typing clinically irrelevant stuff in the medical record to justify higher levels of billing). In the words of CMS, it will favor “patients over paperwork.” You can read all 1472 pages of the proposed changes to the Medicare physician fee schedule here. I was disappointed that the bill was real, but also sort of impressed that the water-works was able to pinpoint my usage, so I asked her about the metering. She explained that we have a smart-meter that transmits our usage on a daily basis to the central office. When I heard that, I asked why, if they could tell we had a problem, that they didn’t notify us or provide us with access to the data. Turns out they intend to make that information available to users in the near future. Cool.